Roy Hodgson believes Crystal Palace were not rewarded for their efforts in Sunday's defeat at Chelsea. Palace lost 3-1 at Stamford Bridge despite posing a substantial attacking threat throughout the game. Andros Townsend cancelled out Alvaro Morata's opener early in the second half but Morata's second and a quick-fire third from Pedro sealed the Chelsea win. "At the start of the second half we played well and got back into the game," Hodgson told Sky Sports. "At that moment I thought we were looking good and looked more than capable of holding onto that, but the second goal puts you on the back foot again and that was quickly followed by the third goal. "At 3-1 you are always going to find it very difficult. Chelsea are bringing on players of incredible quality and are 3-1 up. "I was proud of the way the players kept at it and kept fighting towards the end. "I don't think we were under the cosh by any stretch of the imagination. We were not confronted with lots of chances and opportunities, I thought we kept them at bay pretty well. "We had chances to get to 3-2 so I can't complain bitterly about anything there, just a bit disappointed that the rewards for our efforts weren't better." Having clawed themselves back into the game with Townsend's equaliser on 53 minutes, Palace handed the initiative back to Chelsea with some poor defending for Morata's second. 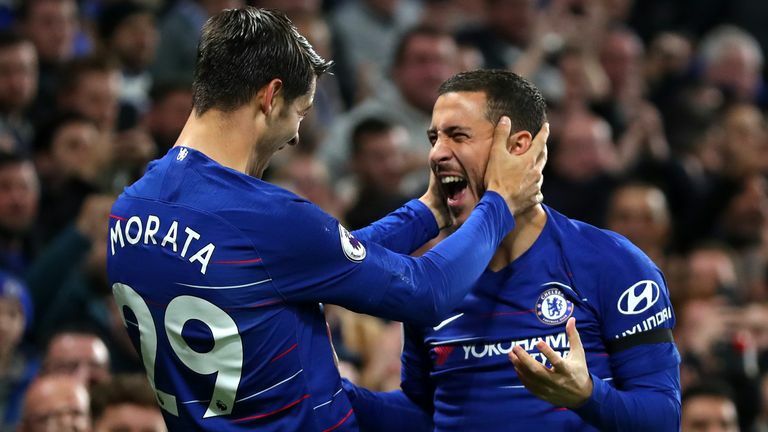 Ninety seconds after coming on, substitute Eden Hazard won and delivered a free-kick into the Palace area which bobbled around before Morata dispatched it past Wayne Hennessey. Despite this, Hodgson is confident Palace are within touching distance of a complete performance, adding: "All goals are mistakes somewhere along the line. "We knew it was going to be a very tough game and we gave it our best shot, I don't think we were battered by Chelsea, but we came out second best. "I am convinced that the way we played and the players we have and the determination we show in games that things will turn around and the points will follow. "To get points you need performances and once again we weren't far away from saying that was a good performance."